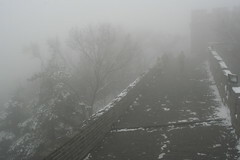 My view of the Great Wall on a trip to Badaling in March. You see, this scientist, Gary Schwartz — a psych professor at the University of Arizona and the founder of a lab that does research on mediums, including Alison DuBois, the inspiration for the American TV series, Medium — has asked dead people a lot of questions. And since Gary Schwartz is not himself a medium, he uses mediums to ask relatively mundane questions about the afterlife. Do you eat? Can you see me when I’m in the shower? He’s also conducted studies that asked people to rate a medium’s accuracy in describing a loved one. They had four rating options: hit, miss, questionable, or “dazzle shot” — in other words, so accurate it was spooky. Although my experience with the “dazzle shot” did not involve dead people, or the afterlife or mediums for that matter, I still think “dazzle shot” is the perfect phrase to describe the accuracy with which my Chinese textbook portrayed my very own life one morning not so long ago. As usual, at 7:40 a.m. I walked downstairs to the bike parking area in front of my building. I tried to unlock my bike, but couldn’t. I stood there and scratched my head for a second. Wait. That’s not my bike. It’s silver like my bike, but not mine. I have a different basket. 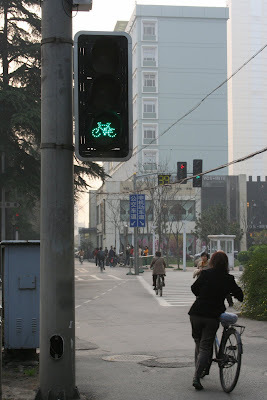 I stood there gaping at the five or six bikes locked up in front of me. I didn’t want to believe my bike wasn’t there, so I just kept staring. When I realized how incredibly late to class I was going to be if I didn’t immediately head for the bus stop, I snapped out of it. I had just bought that bike two weeks before. I seethed on the bus on the way to class — it was the second time this year I had had a bike stolen. I arrived 20 minutes late to class, opened my textbook to the day’s lesson and started reading the text with the class. Halfway through I realized that the character Da Shan (hopefully no relation to the Canadian Da Shan of CCTV9) was living my life. In the text he explains to his friend that he’s been having a lot of bad luck lately. Da Shan: Someone “rode away” on the bike I just bought, and until now he hasn’t returned it. Ai De Hua: And you’re still waiting for him to return it? (Read this with a sarcastic tone and the whole text makes much more sense). we left the weather was so beautiful. As soon as we arrived, it started to rain really hard. We hadn’t brought an umbrella and were completely soaked. The week before that fateful lesson I had in fact been in Beijing and attempted to visit the Great Wall. And while I succeeded in making it to the well-touristed Badaling portion of the wall, I felt like the trip was such a failure that I should immediately start planning another trip to Beijing just so I could actually see the Great Wall the next time I visited. The weather, as it was on Da Shan’s trip, was terrible, except even worse. It was snowing. And just like Da Shan, it wasn’t snowing in Beijing when I left in the morning. It was a little overcast and grey, but I did not expect snow. The fog was so thick I could barely see 50 feet in front of me, so although I was standing on the Great Wall, I did not actually get to see the Great Wall. All of this of course means nothing. My textbook is about as psychic as the gold fish that swim around in a tiny bowl in my living room. It just shows the obvious: that bikes are stolen often enough in China to warrant a chapter in my textbook (the same textbook that had a chapter devoted to diarrhea and food poisoning). But just for a moment, before the “dazzle shot” wore off, I imagined Gary Schwartz starting a new study that measured language textbooks’ psychic ability. Maybe I’ll be lucky enough to see something more like this on my next trip to the Great Wall. 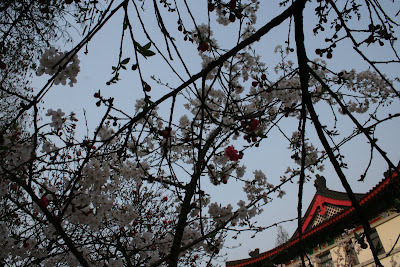 Flowering trees near Xuan Wu Hu. 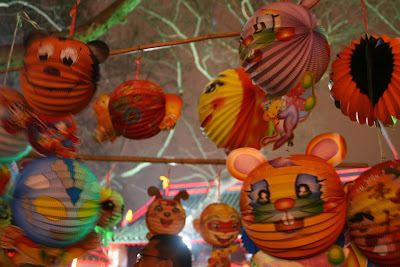 The night before school started a few friends and I decided to brave the Lantern Festival crowds at Fuzi Miao. We arrived at about 8 pm, which was our first mistake. 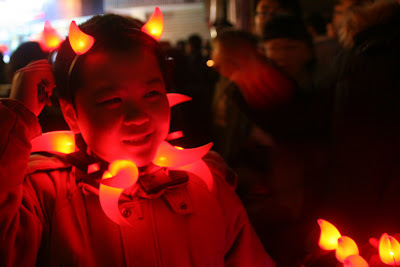 By the time we got there, it was so crowded that a shoulder-to-shoulder line of police was not allowing anyone to enter. 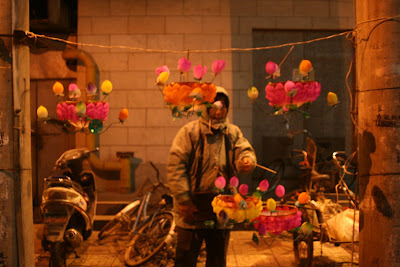 Luckily there were so many people that even the outskirts of Fuzi Miao were incredibly festive. I was mercifully nearing the end of the daily hour-and-a-half of pain when the 11-year-old Korean boy I tutor, Yang Hee, looks up at me and asks me what I thought was a sweet and innocent question. “Of course, Yang Hee,” I said. I shouldn’t have encouraged him. I could see the wheels turning in his head, searching for some newly acquired English he was hoping to practice on me. Finally he spit it out. The same night during the cab ride home I’m in the middle of sending a text message to a friend about my recent “proposal” when the cab driver asks me how old I am. This is always an invitation to further questions about my life, particularly the lack of husband and child. I thought for a second about lying to him, but instead told the truth. As if cued by some invisible director in the back seat of the car, he promptly asked me how I can be 27 years old and not married. 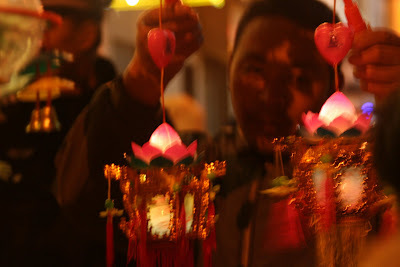 I’m asked this often enough in China to have a few stock answers that I rotate between – usually something about living abroad for a long time or not meeting the right person yet or that “foreigners” often get married later. I think it’s because most of my friends in Nanjing are younger than me, but this question, which usually does not bother me, made me suddenly feel like I should be living in an apartment overrun by cats. I feel like this question in China has a lot to do with the age of the person you’re talking to. My 40-something cabdriver came from a time when getting married young was just what you do. The generation born in the late 70s and 80s generally has a different attitude toward marriage. Though I meet plenty of young women who got married in their early 20s, I also meet many people who are putting off marriage for a career, or just because they can, because they have more choices. But they still have to deal with their parents – about the same age as my cab driver – asking the same questions.